At the age of 21, Jordan Spieth is the new Masters champion. The American led from start to finish in a record-breaking display at Augusta to win by four shots from Phil Mickelson and Justin Rose. His victory followed a second-place finish on his Masters debut in 2014 and confirmed Spieth as a potential champion for years to come. Here, BBC Sport looks at what makes the man and what his win might mean for his future. Famous for its oil and long-running TV drama depicting the lives and loves of the Ewing family, Dallas can now claim another major global sporting star. Jordan Spieth shares a birthplace with fellow Texan Lee Trevino. But while Trevino won the Open, the US Open and the PGA Championship, he never won the Masters. Spieth swung a club almost as a soon as he could walk and at the age of 14 was filmed saying his ultimate goal in life was to win the Masters. Spieth studied at the University of Texas in Austin and played golf for the Longhorns, helping them win the United States College championship. As an amateur, he twice won the US Junior Amateur to match an achievement only ever accomplished before by Tiger Woods. And while still 16 he finished tied for 16th in the 2010 Byron Nelson Championship - bettering any finish Woods achieved as an amateur and giving him the perfect grounding for his future career. "A big key was that I played seven or eight Tour events as an amateur. I know for a fact that if you are going to turn pro without a start on the Tour it's going to be extremely difficult," Spieth said. Spieth turned professional in December 2012 and made an instant impact in the paid ranks. His victory in the 2013 John Deere Classic at the age of 19 years and 11 months made him the youngest PGA Tour winner in 82 years. He was named the PGA Tour's Rookie of the Year, finished 10th on the PGA money list for 2013 and earned a wildcard pick from Fred Couples to play in the President's Cup. If 2013 marked the start of something special, 2014 was the year Spieth confirmed his status as a genuine rising star of golf. He made a remarkable Masters debut, sharing the lead after three rounds with ultimate winner Bubba Watson. He briefly led in the final round before ending tied for second, finishing as the youngest runner-up in the tournament's history and going into the world's top 10 for the first time. His Ryder Cup bow came at Gleneagles in October where he contributed two-and-a-half points from a possible four in the United States' losing effort. Two tournament wins were to follow before the end of the year, including at the Australian Open which he clinched with a course-record final round of 63. "You could give me another 100 rounds today at The Australian and I wouldn't sniff 63.... Well done," a vanquished Rory McIlroy said. Spieth could not have gone to Augusta in any better form after a win in Florida and two second-placed finishes on the PGA Tour. And that hot streak continued underneath the pines and azaleas as he blazed his way to the title, becoming the first player in 39 years to lead from start to finish to become 2015 Masters champion and don the winner's green jacket for the first time. Spieth finished on 18 under par to equal Tigers Woods' record for the lowest winning score in Masters history after shooting the lowest 54 and 36-hole scores en route to victory. With a near flawless performance containing a record 28 birdies over the four rounds, Spieth also became the second-youngest Masters champion, winning at the age of 21 years and 259 days, 155 days older than Woods when he recorded his 1997 win. "To shoot some low rounds, make some putts, and hear those roars, it was remarkable," Spieth said. While a pre-Masters poll suggested double champion Bubba Watson is not the most popular player on tour, Spieth appears to command both respect and goodwill. According to one of his mentors, fellow Texan Ben Crenshaw, Spieth possesses a jeweller's touch and a gun-slinger's eye. But despite shooting down all his rivals, the youngster - who recently launched the Jordan Spieth Charitable Trust to help young people with special needs, military families and junior golf - was a welcome winner among his rivals and peers. Joint runner-up and three-time champion Phil Mickelson said: "He's a tremendous player but he's a tremendous individual too. It's hard not to like the guy, hard not to pull for him." Modesty is another trait Spieth appears to possess. Asked what's best about his game, he answers: "Playing badly well." That certainly helps keep bogeys off the card and he didn't drop a shot from the 15th hole on day one to the fourth hole of the third round of his Masters triumph. He is not the longest hitter but on the greens Spieth is deadly. His one-putt percentage statistics on the PGA tour this season are second only to Matt Kuchar and his record haul of 28 birdies in his Masters win tells its own story. And his up-and-down on the 18th at the end of round three to hold off a charge from Justin Rose was arguably the key to his first major victory. 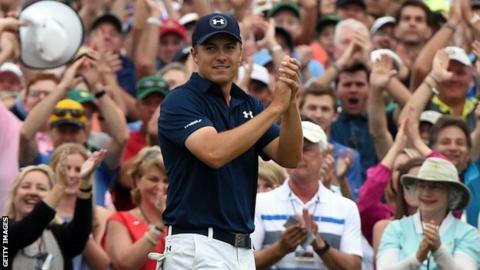 Spieth's Masters win has lifted him to number two in the world - behind Rory McIlroy. Tiger Woods' performance at Augusta on his return after 64 days without competition suggests the former world number one may yet have another major title in him. The 14-times major winner, who had taken the break to work on his game, finished in a tie for 17th. Phil Mickelson and Justin Rose - who tied for second - have also set themselves up for big years. But much of the focus will now be on the duel between Spieth and McIlroy, who still needs the Masters to complete a career Grand Slam of the majors. "He's got four majors, something I can only dream about," said Spieth, who finished six shots clear of McIlroy. "I look forward to getting in the heat of the moment with him a few more times in the near future." The next major on the calendar is the US Open at Chambers Bay, Washington from 18 to 21 June. From there it is on to the Open Championship at St Andrews from 16 to 19 July. The tournament at the 'home of golf' could mark a farewell for five-times champion Tom Watson, 65. But at the other end of the age scale, it is the clash between Spieth and defending champion McIlroy, 25, that may well dominate the build-up. The last of the season's majors is the US PGA Championship at Whistling Straits, Wisconsin from 13 to 16 August. Spieth will be back at Augusta next spring to try to become the first player since Tiger Woods in 2002 to retain the Masters title. As the champion, he is entitled to select the menu for the traditional pre-tournament meal.